The Sokoto Caliphate (1806 - 1906) was the largest state in West Africa since the 16th century. It was created by Muslim reformers in the Hausa states who did not believe their rulers were true believers of Islam. It consisted of conquered Hausa states along with neighboring territories. Sokoto Caliphate existed for over 100 years – a dynasty that bestrode a very large landscape and population in the West African sub-region. The sultan of Sokoto throughout the 19th century exercised an overlordship over the Hausa states extending east from the Niger to Bornu and southward to the Benue and Adamawa. These states and Sokoto itself, known variously as the Sokoto or Fula empire and Hausaland, came (c. 1900-1903) under direct British control, but the native governments are maintained. Developed in the context of multiple, independent Hausa kingdoms, at its height the Caliphate linked over 30 different emirates and over 10 million people in the most powerful state in its region and one of the most significant empires in Africa in the nineteenth century. The caliphate was a loose confederation of emirates that recognized the suzerainty of the "commander of the faithful", the sultan or caliph. The province of Sokoto occupied the north-west corner of the British protectorate, and was bounded west and north by French territory. South and east it adjoins other parts of the British protectorate. Bordering north on the Sahara, it contained much arid land, but south-west the land was very fertile. Running through it in a south-westerly direction is the Gublin Kebbi or Sokoto river, which joins the Niger. On a tributary of this river is the town of Sokoto. The Sokoto or Fula empire was founded at the beginning of the 19th century. The country over which the Fula ruled had, however, a history going back to the middle ages. Between the Niger and the kingdom of Bornu the country was inhabited by various black tribes, of whom the Hausa occupied the plains. Under the influence of Berber and Arab tribes, who embraced Mahommcdanism, the Hausa advanced in civilization, founded large cities, and developed a considerable trade, not only with the neighboring countries, but, via the Sahara, with the Barbary states. The various kingdoms which grew up round each large town had their own rulers, but in the first half of the 16th century they all appear to have owned the sway of the Songhoi kings in Timbuktu. 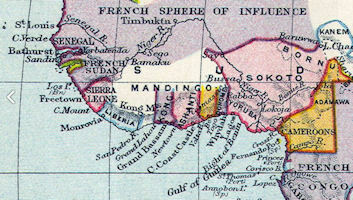 On the break up of the Songhoi empire the north-eastern part of Hausaland became more or less subject to Bornu, whose sultans in the 17th century claimed to rule over Katsena and Kano. In this century arose a dynasty of the Habe, a name now believed to be identical with Hausa, who obtained power over a large area of the northern portion of the present British protectorate. The Hausa, whose conversion to Mahommedanism began in the 12th century, were still in the 18th century partly pagans, though their rulers were followers of the Prophet. These rulers built up an elaborate system of government which left a considerable share in the management of affairs to the body of the people. Dwelling among the Hausa were a number of Fula, mostly herdsmen, and these were devout Mahommedans. One of their more cultivated teachers, Othman Dan Fodio, had been tutor to the king of Gobir (a district north of EstablishSokoto). He incurred the wrath of that king, who, angered at some act of defiance, ordered the massacre of every Fula in his dominions. The Fula flocked to Fodio's aid, and in the battle of Koto or Rugga Fakko (1804) the king of Gobir was utterly defeated. Thereupon Fodio unfurled the green banner of Mahomet and preached a jihad or religious war. The chief intention of the Sokoto jihadist headed by Usman Dan Fodio was to restore the fading fame and glory of Islam. In other words, the jihadists were bent in their irrevocable task to purify Islam with the worship of images and idols. They found it against the laws of Islam to worship Allah and idols at the same time. In Hausa land, the leaders valued the worship of idols, they offered sacrifices to idols so as to safeguard their throne and protect their land against calamity. Textualism and emphasis on a return to Koranic fundamentals were central to the "Jihad" of Shefu Ousmane Dan Fodio, who brought a measure of both political and spiritual stability to northern Nigeria and southern Niger in the aftermath of the Songhai Empire's collapse. The Songhai Empire's successor chieftaincies were politically incoherent, and the brand of Islam practiced in their palaces, while broadly within the Sufi tradition, included many unorthodox practices. Islamic laws limiting polygamy and addressing prayer, inheritance, and governance were ignored. An accretion of organic practices led to an "impure" version of the faith. From 1804-1812, Dan Fodio and his followers led a successful "jihad" to purify the Muslim faith and establish a political system that would enable "true belief and right practice." The end result was the establishment of the Sokoto Caliphate in Northern Nigeria and the imposition of a more rigorous, though still Sufi, version of the faith. This Qadiriyya jihad set the tone for Islamic practice for the better part of a century. Ousmane Dan Fodio is still revered by many Nigeriens, who name mosques and streets after him. Interestingly, Maradi in Niger was one of the small kingdoms that held out against the Qadiriyya Sokoto Caliphate in the early 19th century. But what force of arms did not accomplish, trade and cultural exchange among the Hausa populations of the sub-region did. The Qadiriyya Islam that Dan Fodio encouraged played a major role in other parts of Niger throughout the 19th century, before declining to a more marginal status in the 20th. In February 1804, Dan Fodio declared jihad aimed at cleansing his society of non-Islamic activities. Dan Fodio’s main purpose was the establishment of Islamic law and Islamic ideals as the basis of government in the place of systems ridden by non-Islamic laws, observances and practices. Dan Fodio accused the Hausa rulers of polytheism. He accused the rulers from deviating from the path of God (Allah) and “raised the flag of the kingdom of the world above the flag of Islam and are thus unbelievers”. Furthermore, the Habe rulers were accused of imposing uncannonical levies on their subjects. They were accused of turning their land into the land of unbelievers and that the rulers themselves were not true Muslims and as such could not make true Islam the State religion. Therefore, Dan Fodio justified the emigration from these unbelievers as a means of avoiding their wrong doings which were not primarily based on Islamic law and values. The principal aim of Dan Fodio was to restore the practice of Islam to “the classical pattern of the early rightly guided caliph”.9 It was the conviction of Dan Fodio that if the Hausa rulers were true Muslims, they would not have engaged in illegalities with regard to imposing uncannocal levies, denying the “faithful” the right to practice their religion (Islam) and not basing their administration on Islamic law and value. In other words, the concern of Dan Fodio was to cleanse the society of unislamic activities so as to give room for people to practice orthodox Islam. In a few years the Fula had subdued most of the Hausa states, some, like Kano, yielding easily in order to preserve their trade, others, like Katsena, offering a stubborn resistance. Gobir and Kebbi remained unconquered, as did the pagan hill tribes. The Fula were also defeated in their attack on Bornu. In most places they continued the system of government which had grown up under the Habe, the chiefs or emirs of the various states being, however, tributary to Dan Fodio. This sheik established himself at Sokoto, and with other titles assumed that of Sarikin Muslimin (king of the Mahommedans). As such he became the recognized spiritual head of all the Mahommedans of west central Sudan, a headship which his successors retained unimpaired, even after the loss of their temporal position to the British in 1903. The Jihad led by Shaykh Dan Fodio remained the greatest phenomenon to have shaped the socio-political, intellectual and diplomatic structures of the larger segment of the contemporary West Africa. 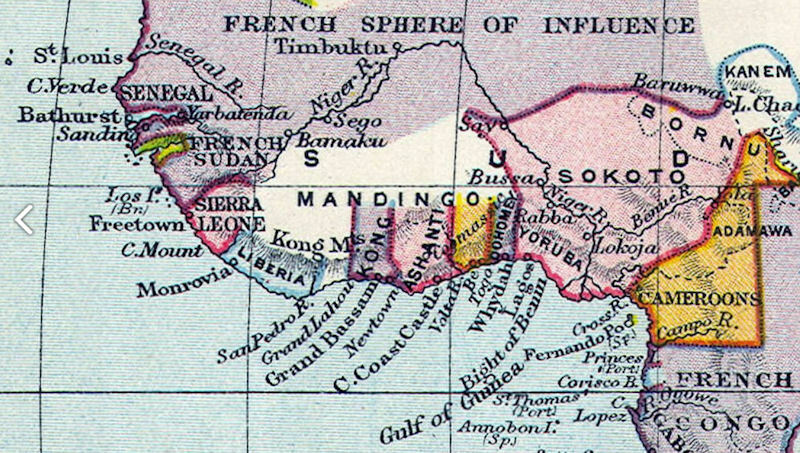 The mainstream scholars on this subject agree that the zeal to spread the teachings of Islam, the cleansing of Muslims of West Africa from idol worshiping, superstitious and heresies and indeed, the transformation of the economic and political systems of the region were the original objectives of Shaykh Dan Fodio and his Jamaa (companions). The corruption and contradictions which manifested themselves in the heathen practices at both individual and state level, the burdensome taxes, dynastic disputes among the ruling elites, the extortionist policy of the various governments and rampart maladministration at all levels of governments in Western Sudan before 1804 AD, gave opportunity of success to Shaykh Dan Fodio and his Jamaa. 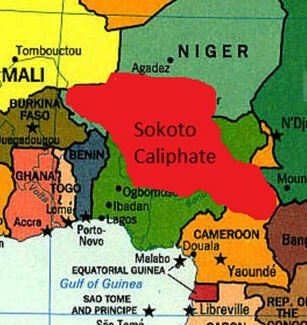 By 1817 a remarkable revolution which swept across Bilad Sudan (Western Sudan/West Africa) from 1804 resulted in the establishment of Sokoto Caliphate with Capital at Sokoto currently in Northern Nigeria. The Caliphate with over 31 emirates established justices, integrity, honesty and multicultural statecraft and mutual co-existence in the realms of political administration, economics, social imperatives and diplomatic affairs. 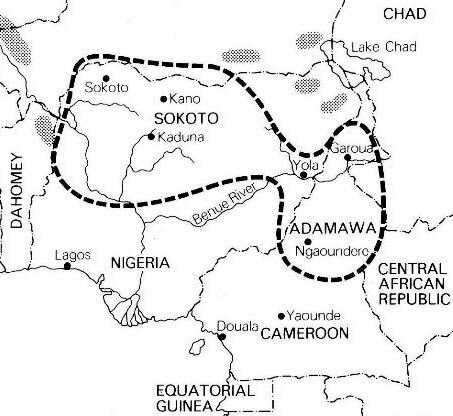 Othman Dan Fodio divied the Fulami empire into two - the Eastern and Western sections. The Eastern section included Kano, Katsina, Zaria, Bauchi,Gombe and Yola with Sokoto as its capital while Ilorin, Kontagoro and Argungu with Gwandu as its capital were included in the Western section. The Western zone of the Sokoto caliphate was administered from Gwandu. On the death of Fodio (c. 1819) the empire was divided between a son and a brother - the son, famous under the name of Sultan Bello, ruling at Sokoto, the brother at Gando. All the other Fula emirs were dependent on these two sultanates. About four decades into its creation, the Caliphate began to decline in contents and substance ostensibly in line with the Ibn Khaldunian cyclical theory of the rise and fall of nations. The Fula power proved, before many years had gone by, in many respects harmful to the country. This was especially the case in those districts where there was a large pagan population. Slave-raiding was practised on a scale which devastated and almost depopulated vast regions and greatly hampered the commercial activity of the large cities, of which Zaria and Kano were the most important. The purity of the ancient administration was abandoned. The courts of justice became corrupt, administrative power was abused and degenerated into a despotism controlled only by personal considerations, oppressive taxes destroyed industry and gradually desolated the country. Soon after the Fula had established themselves Europeans began to visit the country. Hugh Clapperton, an Englishman, was at Sokoto in 1823 and again in 1827, dying there on the 13th of April of that year. Heinrich Barth made a prolonged stay in various Hausa cities at dates between 1851 and 1855. To Barth was due a great deal of early Western knowledge of the country. In Barth's time American merchants were established on the Niger, bartering goods in exchange for slaves. This traffic was carried on through Nupe "to the great damage" wrote Barth, "of the commerce and the most unqualified scandal of the Arabs, who think that the English, if they would, could easily prevent it." The over-seas traffic in slaves did not continue long after the date (1851) to which Barth referred, but slave-raiding by the Fula went on unchecked up to the moment of the British occupation of the country. At Sokoto the sultanship continued in the hands of Fodio's descendants, and the reigning sultan concluded in 1885 a treaty with the Royal Niger Company (then called the National African Company) which gave to the company certain rights of sovereignty throughout his dominions. In 1900 the rights of the company were transferred to the Crown. 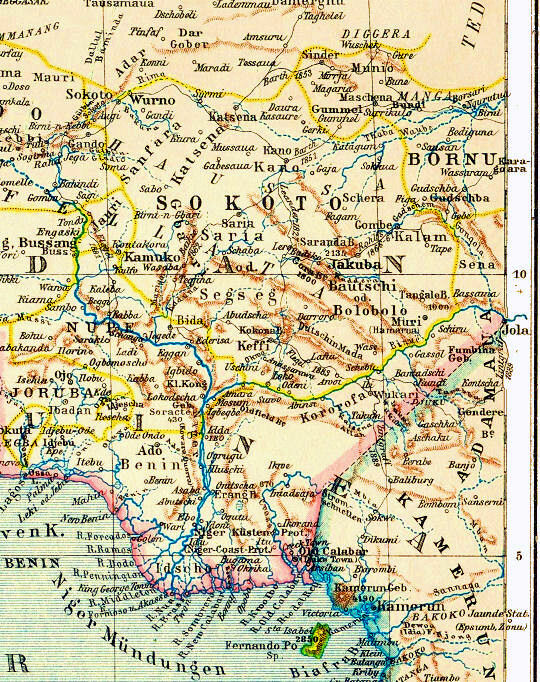 In the course of the years 1900-1902, British authority was established in the states bordering to British on the Niger and the Benue and in Bornu. O-kunland provided the needed base for the British conquest of Northern Nigeria as clearly demonstrated in the subsequent attacks, bombardments, conquests and occupation of other parts of the Caliphate – Bida, Ilorin, Borgu, Idah, Borno, Zaria, Gwandu, Kano, Kotangora, Katsina, Kebbi all fell to British forces, especially between 1900 and 1906, the period which can be described as the early years of British colonialism and subsequent transformation of the Sokoto Caliphate into what later became Northern Nigeria. The northern states declined to fulfil the conditions of the treaties negotiated with the Niger Company or to submit to the abolition of the slave trade, and in 1902 Sokoto and Kano openly defied the British power. A campaign was undertaken against them in the opening months of 1903 in which the British troops were entirely successful. Kano was taken in February 1903, and British forces moved towards Sokoto, with small skirmishes between Fulani troops and the colonial army along the way, they finally reached Sokoto on 13 March 1903. In Sokoto, the new Sultan prepared for war against the British. He had just ascended the throne of his forbearers and he was not a party to the series of agreements and negotiation between the former Sultans and representatives of the British Empire. War was upon him, he had only two options, to surrender or fight for a just cause. He chooses the later and etched his name in history. The battle for the Caliphate started outside the city on 14 March 1903 and ended the following day. The Sokoto Caliphate was crushed. The Fulani forces were no match for the colonial forces armed with modern weapons. The Sultan and the Emir of Kano escaped and started the long and arduous march eastward with the British hot on their heels. The Emir of kano, Aliyu, was captured and was exiled to Lokoja, until his death in 1926. The two forces finally met hundreds of kilometers away in the small town of Burmi on 27 July 1903, and the Fulani army was annihilated. So many heroic deeds of valor of epic proportion were recorded on that day. The Sultan died fighting with more than ninety of his followers surrounding him; his body was removed from their pile. Several emirs and their followers died on that day. The British also suffered causalities. From that day British authority was substituted for Fula authority throughout the protectorate. The emir of Sokoto took an oath of allegiance to the British Crown and Sokoto became a British province, to which at a later period Gando was added as a subprovince — thus making of Sokoto one of the double provinces of the protectorate. The double province thus constituted had an area of about 35,000 sq. m., with an estimated population of something over 500,000. It included the ancient kingdoms of Zamfara on the east and Argunga or Kebbi on the west. The dominions of the emir of Sokoto suffered some diminutions by reason of British agreements with France relating to the common frontier of the two European powers in the western Sudan. The emir felt deeply the loss of territory ceded to France in 1904 but accepted the settlement with much loyalty. Like the emir of Kano the new emir of Sokoto worked most loyally with the British administration. 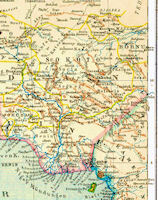 The province was organized on the same principle as the other provinces of Northern Nigeria. A British resident of the first class was placed at Sokoto and assistant residents at other centers. British courts of justice have been established and British governors are quartered in the province. Detachments of civil police were also placed at the principal stations. The country was assessed under the new system for taxes and is being opened as rapidly as possible for trade. After the establishment of British rule farmers and herdsmen reoccupied districts and the inhabitants of cities flocked back to the land, rebuilding villages which had been deserted for fifty years. Horse breeding and cattle raising formed the chief source of wealth in the province. There was some ostrich farming. Except in the sandy areas there was extensive agriculture, including rice and cotton. Special crops are grown in the valleys by irrigation. Weaving, dyeing and tanning are the principal native industries. The emir of Gando, treated on the same terms as the emirs of Kano and Sokoto, proved less loyal to his oalh of allegiance and had to be deposed. Another emir was installed in his place and in the whole double province of Sokoto-Gando prosperity has been general. In 1906 a rising attributed to religious fanaticism occurred near Sokoto in which unfortunately three white officers lost their lives. The emir heartily repudiated the leader of the rising, who claimed to be a Mahdi inspired to drive the white man out of the country. A British force marched against the rebels, who were overthrown with great loss in March 1906. The leader was condemned to death in the emir's court and executed in the market place of Sokoto, and the incident was chiefly interesting for the display of loyalty to the British administration which it evoked on all sides from the native rulers. Created on 03 February 1976, Sokoto state covers a total area of 25,973 km2 (10,028 sq mi) and has a total population of 3,702,676 as at the 2006 census. With an average population density of 170/km2 (440/sq mi) and a total GDP (2010) of $4,818 Million, at $1,274 Per Capita. Sokoto State is located in the extreme northwest of Nigeria, near to the confluence of the Sokoto River and the Rima River. Sokoto City is the modern day capital of Sokoto State (and its predecessor, the Northwestern State). The name Sokoto (which is the modern/anglicised version of the local name, Sakkwato) is of Arabic origin, representing suk, 'market'. It is also known as Sakkwato, Birnin Shaihu da Bello or "Sokoto, Capital of Shaihu and Bello").